Shut out anything in your life that is negative and depressing. If it’s not, then cut it out from your life and completely disconnect yourself from it, otherwise you’re allowing your life and energy to be cluttered and blocked. You have a fabulous life to create and live, remember that! 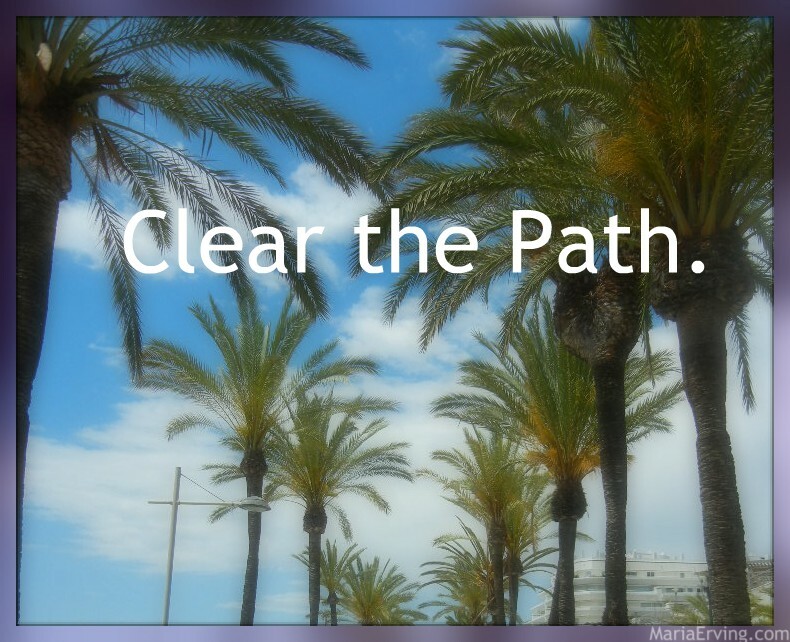 No time for mental and energetic clutter that is only going to block you and hinder you from achieving and attracting your good to you. Decide to have a sharp, fresh and clear mind that is open to the opportunities of the Universe. Where we put our attention that’s also where we put our energy so be very attentive to what and who you devote your energies to. Protect your peace, don’t let fear scare you, and let go of the things you can’t control while continuing doing what you were put on this earth to do. Do you, and do it unapologetically and with a ruthless dedication to follow the energy of your own life’s flow. When things come up that you can’t deal with right now, put them in a “box” or journal about it with the intention to surrender and let go. It can be an actual box where you put notes of things you can’t control, knowing that when you have done all you can or if there’s something that you can’t do anything about, the Universe can and will handle it or do the rest. When you stop focusing on things you can’t do anything about, many times you’ll find that then it often takes care of itself. Or you’ll be inspired to take some kind of action. Inspired, not motivated by fear and anxiety, but inspired. But it can’t be shown to you until you have removed yourself from the dark, negative and depressive energy. Worry and fear blocks the flow. So does resentment, jealously, blame, guilt etc. So clear out all that from your mind and life and get back into the flow. And when you’re back in the flow, then you will be shown what to do (if anything) in a completely natural and obvious way (it’s not something you have to force). Miracles and magical unfolding is also common when you let go of and surrender the things that are dragging you down and that you have no control over anyway. So don’t wallow in worry and don’t discuss your difficulties with other people (unless it’s solution-focused), especially with people who are not supportive and who doesn’t have a positive and optimistic mindset. What is happening ‘in here’ is also happening ‘out there’. However you life looks at the moment, refuse to get pulled into any kind of negativity or depressive energies and instead smile (find ways to feel gratitude), and watch how the world and the Universe responds to the new vibe you emit. Make sure you don’t feed any negative suggestions/ideas and your mind chatter, instead turn within and become aware of what you consider as important in the situation. It doesn’t matter how things are, it only matters how you are – energetically and in your attitude. What you put your attention and energy into, that’s the direction your consciousness will go, so see to it that you nourish the right path. You have the power to shape your experience simply by the way you approach it so ask yourself who you are devoting your energy to and if it’s helpful. If it’s not helpful, then turn away from it immediately and start focusing your energy in a different direction and consciousness will follow where you direct it. You have the power that by choice choose a different direction and the moment you choose something else, that will then start to mold itself and become the new unfolding of your reality. Focus on the good and good will follow. Focus on the negative and depressive and more of the same will unfold for you. So always choose to go with and in the flow of Light, Trust, Gratitude, Positive Energy and Consciously Focused Attention on the things that are life-affirming and helpful.